What does Mukisa Mpewo do ? We make ugandan handcrafts pottery and baskets. The Biscuit pottery* is the result of only one firing of clay, pure and natural, so without any enamelling or chemical treatment. The competences, talents of creativity and experience of our founder and chairperson, Jane Nabyonga, allow us to improve this technique which is now our speciality. - allow to cook more healthy and tasty dishes. 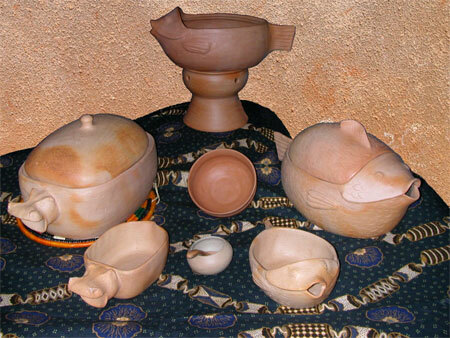 Our pottery, pots, dishes, plates, cups, mugs, coffee or tea pots and flower vases are all made in the traditional way, by hand using only traditional tools with normal, best quality clay from Uganda. They are first shaped moulded in the « green » level (dry); fired to biscuit; and re-fired using a special technique. The finished pot will keep hot things hot or cold things cold for a long time. Large size pots with a big ball-shaped base, long thin neck and stopper are used as traditional refrigerators. Smaller size pots keep water or wine cool and coffee or tea hot. If the stopper is replaced by a natural « sponge » (a loofah - the dried fibrous interior of a type of gourd), this one will work as a strainer. Vases keep flowers fresh longer because the water stays cool and the flowers can breathe. 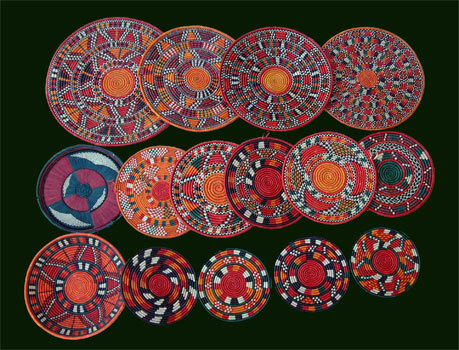 Our baskets, nubian tabagas and kutas, patchworks, toys, wall hangings, etc, are originally hand made from Uganda in a traditional way using only traditional tools with best raw materials like young papyrus straw, milet straw, raphia, banana straw and fibers.